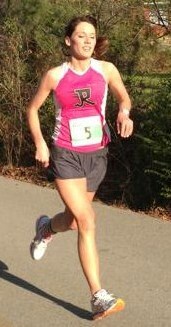 Although not a full, the Bentonville Half Marathon is by far my favorite race! I also have loved the Bass Pro 50k Trail each time I’ve raced in it. Running (of course! ), reading, painting, playing with my dog. To continue to get faster and stronger. I plan to complete a 50 mile race in 2015. So I can drink all the beer I want, guilt free! Kidding! I run because it makes me happy, keeps me fit, and has allowed me to develop amazing friendships. Achieving my BQ and PR earlier this year at the Revel Rockies Marathon in Denver, CO. I collapsed at the finish line, had tears fill my eyes, and experienced one of the happiest moments of my life. Many times I have had others pace me, and have depended on their leadership to help carry me to my goals. I’m honored to have opportunities to do the same for other athletes, and to encourage them each step of the way. Earlier this year at the S2S Marathon I helped one of my friends as he achieved his goal of sub 4:00. It was incredible to share in his excitement as he proved his strength and tenacity! You’ve put in the work for months leading up to race day. I promise to do everything in my power to help you cross the finish line with your goal time in mind! We’ll have fun and rock it each step of the way! Relax! This is supposed to be fun! Trust in your training, eat some spaghetti, and enjoy! My family and friends have been my rock and support through my training. Don’t forget to thank your support network for hanging by you through all of yours! Girls on the Run, volunteering at races when I’m not running in them, and I’m serving meals to families in need this holiday season.